Varsha Kharatmal showed a talent for visual art at a young age. She was nurtured by her father, an art teacher, and grew up with painting, photography, and calligraphy. Deaf since birth, Varsha attended a special school for hearing impaired children. But as she transitioned from this school to a regular art college, she faced difficulty in spoken lectures. She persisted through textbooks and notes, and was found to be the best in drawing among the female students of her class. She connected with the best male student, Ramchandra Kharatmal, and they ended up marrying. Along with her husband, she paints and exhibits frequently. 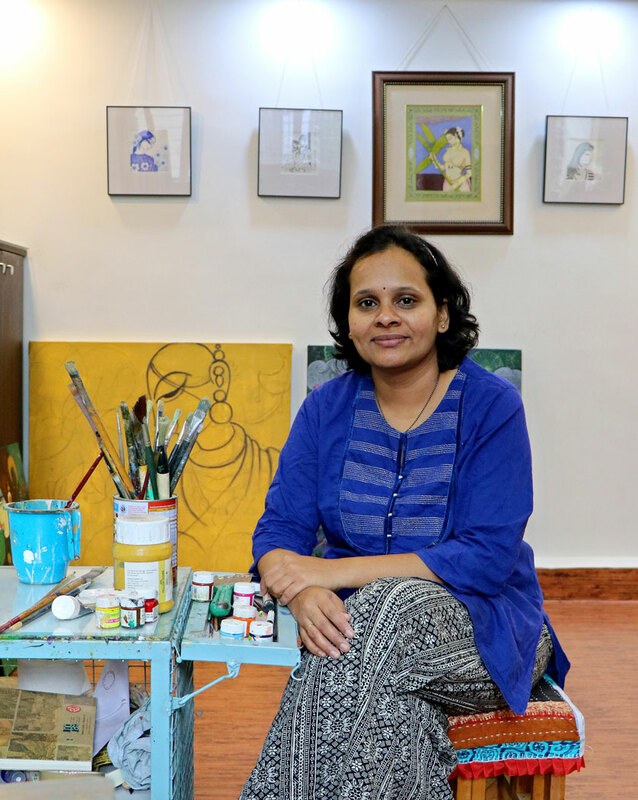 She has participated in twenty group exhibitions across India since 2006 and has held two solo exhibitions in Pune. In addition, she participated in the All India Art Exhibition and the India Art Fair several times, as well as workshops and art camps. 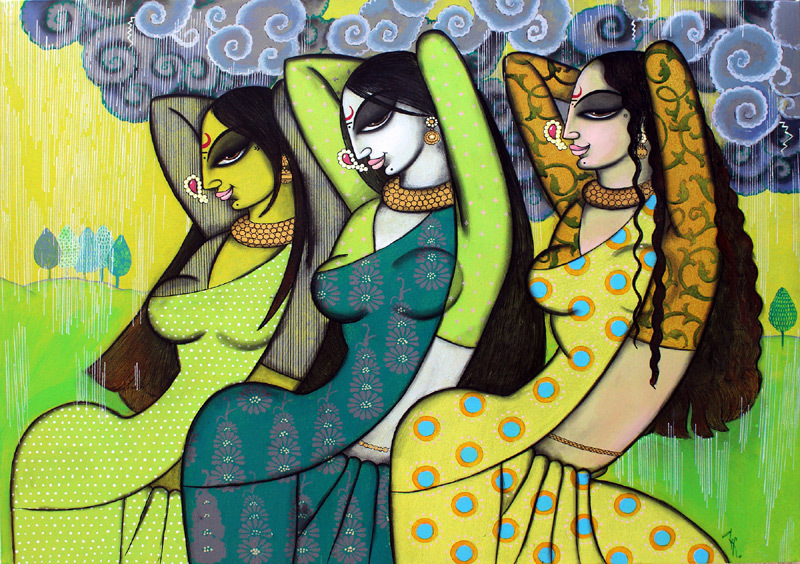 Varsha’s paintings are decorative and stylized, influenced by the artist A.A. Almelkar. She displays acute realism in the women’s saris and jewelry, combined with traditional Indian miniature motifs in the backgrounds. Her “Ajantaesque” paintings feature women in rich jewel tones and decadent patterns, gazing at the viewer from under heavy lids, daring them to gaze back. 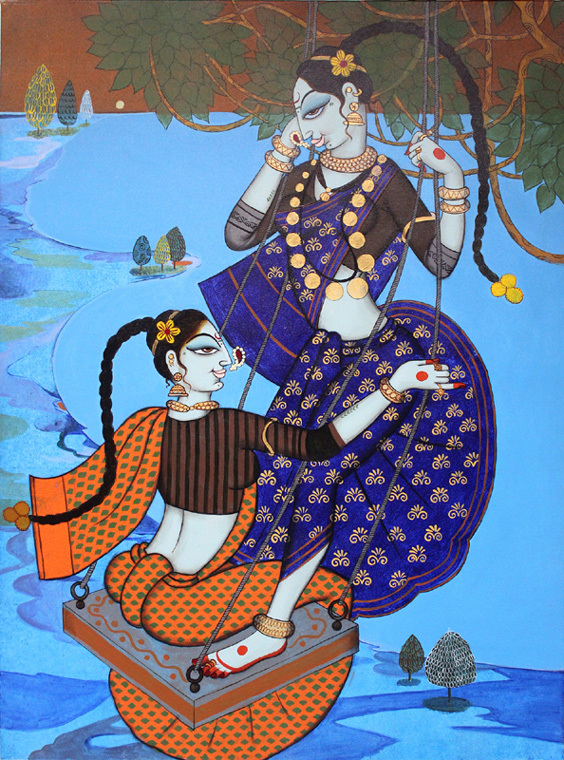 As the viewer takes a closer look, they will see the level of mastery and care with which Varsha has created this sensuous and stylized world. “Beautiful Ajantaesque Decorative Painting By Mrs.Varsha Kharatmal.” YouTube, uploaded by S.S. Group Of Art Vision, 28 Jan. 2018. Chandola, Gayatri. “Art That Speaks: A Profile of Varsha Kharatmal.” Eikowa, 21 June 2016. “Guided Painting Workshop By Varsha Kharatmal.” YouTube, uploaded by Beautiful Minds Store, 19 Apr. 2017. “Kharatmal Art Exhibit at Bharat Bhavan Till Sunday.” The Pioneer, 20 Dec. 2017. Lawate, Kartiki Nitin. “When Artists Tell Stories.” Mid-Day.com, 20 Apr. 2012.